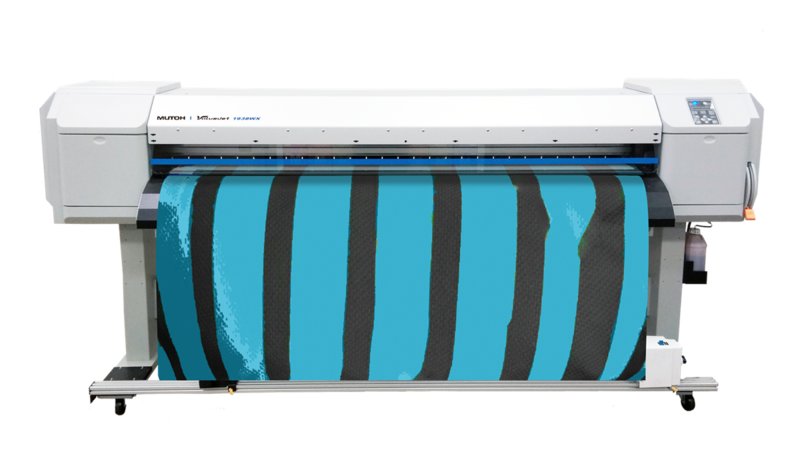 The Mutoh ValueJet 1938WX is Mutoh’s new 74” printer, perfect for high-production dye-sublimation applications. Create scarves, blankets, promotional items, trade show graphics, flags, banners, custom interior designs, apparel, sports uniforms and more. Designed with advanced features like; a rear media feed lever for easy material handling, take-up system, an easy to navigate control panel and simple operation, the learning curve is short so you can focus on customers and profits. The VJ 1938WX provides outstanding performance at a competitive price, making it the smart printer choice for shops looking to expand applications, increase production and improve efficiency. Mutoh's ValueJet 1938WX is perfect for all dye sub applications such as all-over apparels, cut & sew athletic jerseys, banners, flags, mugs, iphone and ipad cases, mats, carpets and more.